"Stocking stuffer" is one of those odd holiday terms whose meanings have gradually bent and broadened over time. Not all of us hang oversize socks on December 24 in the hope of seeing them filled the next morning, but we all get the gist of what that filling consists of—items that are modest in size, but big in meaning or just plain fun for the recipient. And, though you may have grown up with parents who religiously stuffed your stocking with a Red Delicious apple, holiday nut mix, and candy cane–shaped M&M tube every year, you're an adult now, and you can ask for and give whatever small, thoughtful presents you like. Keeping in mind the purists out there who really do adhere to traditional stocking dimensions when buying such gifts, we've assembled a few of our favorite cooking-oriented goodies that are not only affordable and useful, but also of a compact size—many of them long and slender, the better to peek alluringly out of the top of that sock. Of course, they'll also do great for a Secret Santa exchange or Yankee swap, as gifts for party hosts or those cousins-in-law you see only once a year, or as super-nice favors if you're throwing your own shindig. If nothing you see here fits the bill, we've got a whole category of stocking stuffers over at the Serious Eats holiday gift guide to meet all your diminutive-gift needs. If you think of culinary tweezers as the exclusive realm of snobbish haute cuisine, take a moment to consider their merits, as presented by Sohla in this convincing love letter. They can grab, flip, and turn bits of food more deftly than any pair of tongs. 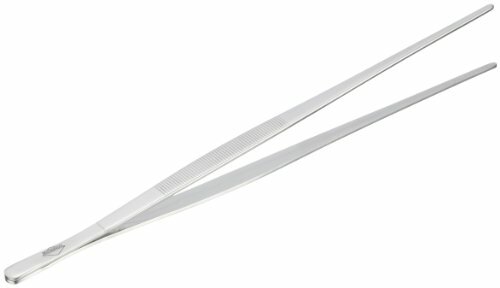 We recommend two different styles of tweezers: one thin and long for tong-like work, and one small and fine-tipped for digging into narrow jars and bottles. Either is a perfectly useful little gift for any serious cook. Sure, it's a bit...specific, but for those who fish, and for those who like to purchase their fresh fish whole and ungutted, this efficient fish scaler is a godsend. It's relatively heavy and has a narrow head design that makes short work of most any fish you can throw at it, with minimal scale spray. If you know someone who insists that the back of a butter knife or a clamshell works just fine, buy them this nifty little item, and watch the scales fall from their eyes. Not just a musical instrument, the spoon may be one of the most important and yet often-overlooked pieces of kitchen equipment. Many home cooks don't give much thought to the implement they use to stir, scrape, and taste their soups and stews, which is exactly why a quality perforated spoon (for scooping up food, like stewed meat or beans, from its surrounding liquid) or sauce spoon is the ideal stocking stuffer. We like the not-overly-long handles and generously sized bowls on these models in particular. We concluded long ago that the Y-peeler is the best peeler, hands down. The wider handle makes it more comfortable to grip, it can be used in either hand (unlike a swivel peeler), and the carbon steel blade on our preferred Kuhn Rikon model will stay good and sharp as long as you're careful to wash and dry it after each use. Because peelers are cheap and get a ton of use—and because most every cook will never bother to sharpen their peeler's blade—it's best to buy several at a time. A good peeler is perfect for anyone, but it's an especially good stocking stuffer for a certain gift guide writer who has repeatedly complained about his swivel peeler on these digital pages. These two make a lovely pair of small gifts for the pastry wizard on your list. 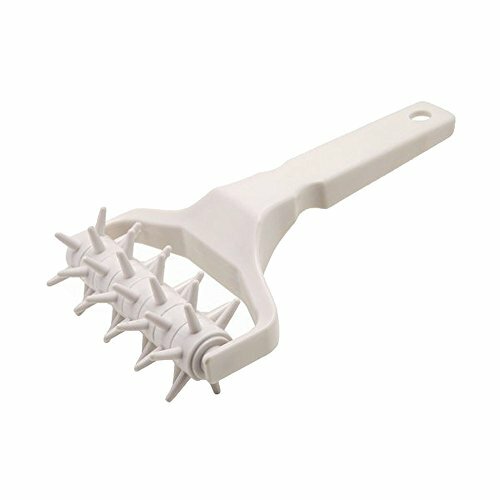 A fluted pastry wheel is purely for looks, scalloping the edges of your pie lattices, ravioli, and homemade Biscoff cookies so they look as good as they taste. Meanwhile, the docking tool, though the dots it leaves behind can also serve a decorative purpose, is seriously useful for getting your dough to lie flat while it cooks, whether it's for pizza, crackers, or shortbread. A mini rubber spatula is a great example of a tool that seems silly until you own it. Then you'll discover how good it is at rooting around in the tiniest spaces—coffee grinders, impractically small-mouthed jars that need to be scraped of honey or jam, you name it. These spatulas are also heat-resistant, so they'll be there when the recipient needs to stir up a small pot of sauce or caramel. Here's a tool that a lot of people think they can get by without (yeah, you, the savage eating ice cream on the couch with a teaspoon, straight from the pint! ), which just goes to show you that an ice cream scoop is the ideal thing to give as a gift. But not all scoops are created equal. This one works for both lefties and righties, and the handle is cleverly designed in a way that transfers heat to the scoop, helping it slide more readily into a frozen-solid surface. And that just means less time you or your giftee will have to spend waiting around during emergency ice cream moments. A stocking isn't really stuffed unless it's got some kind of candy or snack. Hershey's Kisses might have placated your giftee's youthful sweet tooth once upon a time, but now that we're all grown-ups here, you may want to spring for something a little more sophisticated. Thin, melt-in-your-mouth chocolate disks topped with crunchy cacao nibs, tossed in caramel and fleur de sel? Yes, please.